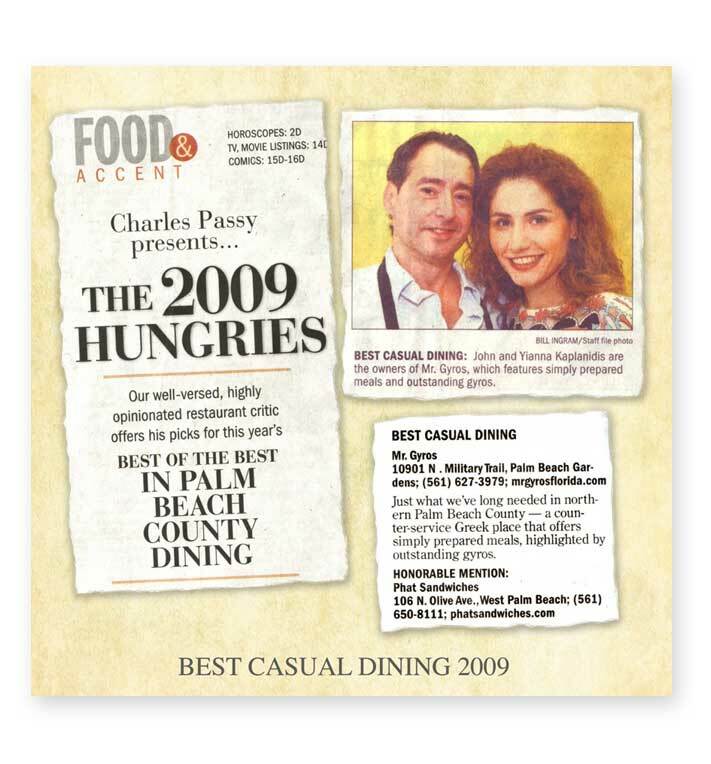 Mediterranean cuisine, featuring plenty of appetizers, gyros, entrees and desserts. There are lots of sides too: fries (regular and sweet potato), onion rings, roasted potatoes, string beans and Greek salad. Greek and Mediterranean favorites will delight diners at Mr. Gyros in Stuart. It’s like a fast-food restaurant, where you order at the counter. Drinks are self-serve. I found the gyros of my dreams. The “xtra” special chicken gyros ($9.99) wrapped up a tasty combination of chicken, grilled peppers and onion, tomatoes and feta cheese. Tzatziki was served on the side, but the sandwich didn’t need it. In addition, there is a choice of a side dish, and I went with a Greek salad. For dessert, I shared a large piece of baklava ($3.95) with my husband. It was a very sweet and nutty ending to a wonderful meal. Fans of Greek food can’t go wrong here. There are lots of choices for vegetarians, including spinach pie and stuffed grape leaves. It’s all Greek, from appetizers to salads, gyros, pita wraps, entrees and desserts. Start with a sampler of four spreads, work your way through a souvlaki dinner and save room for the baklava. 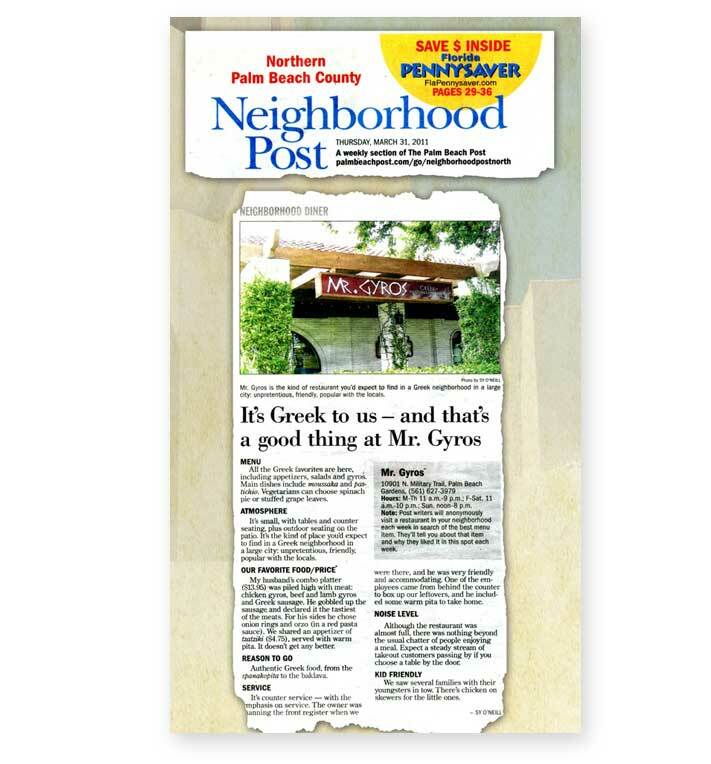 Enjoy Greek fare, from appetizers to entrees and desserts, at Mr. Gyros in Jupiter. New to Jupiter, it’s a busy little place, where you order at the counter and pick up your meal when your number is called. Drinks are self-serve. There’s plenty of table seating. We all shared an appetizer of tzatziki ($4.99), a mixture of yogurt, garlic, dill and cucumber that can be heaped on a slice of warm pita. Heaven! I’m a fan of spanakopita – spinach pie – so I ordered the entrée ($10.99) and it did not disappoint. Two large pieces of pie came with two sides of my choice: I selected the yummy roasted potatoes, which were lemony and good, and a Greek salad. My daughter chose the “xtra” special chicken gyros ($9.99 with a side), which was bursting with flavor and ingredients: chicken, peppers, onions, tomatoes and feta cheese. My husband’s favorite is the combo gyros ($9.39 with a side), a mixture of chicken, lamb and beef. For dessert we shared baklava ($3.95), flaky phyllo layered with walnuts and honey. It was the perfect sweet ending to our meal. Awesome Greek food, ample portions, good prices. The baklava is outstanding.